This drop ride is not the tallest or the fastest, but it succeeds where most other rides of this type fail. It lives up to its name and does create atmosphere. The audio effects, visual effects, and the overhang all work together to distract and obstruct the rider so that they are surprised when the inevitable drop comes. Its surprising to me that drop towers didnt add any of these elements before now. I love the Larson/ARM tower rides and Moreys may have the best. OK so Id probably take Lake Winnies ride but you cant beat the combination of lights, sounds and fog that AtmosFEAR delivers. Like the others I have done, you get that slow rise to the top before that killer plummit that offers up little warning. The sound effects on the ride are great in that you cant hear the "spoiler", if you will, of when the car will fall. This is one kickass ride. All this year I heard "AtmosFEAR coming to Moreys Piers", "A whole new ride experience, coming to Wildwood" and stuff like that. In the lobby of the hotel my family stayed at I picked up a Moreys Piers brochure complete with a photo of AtmosFEAR in front of a stormy background with the car blurring down the tower. At the boardwalk you can see it from anywhere with its multicolored LED light show, occasionally a car will crawl up only to drop like a rock. Do you think the beginning of this review over hypes AtmosFEAR? I bet not as much as Moreys Piers did during the off season!!! This ride was so over hyped that I thought I had already been on it once I got in line for it. 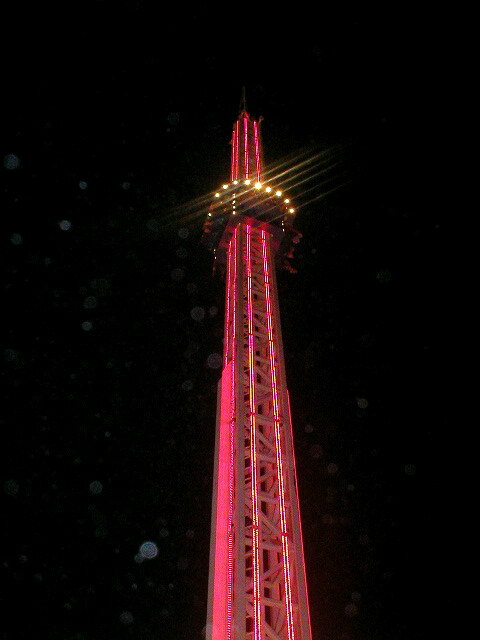 The ride is a 140 foot ARM drop tower that can hold 12 people per drop. The ride works by a winch that hoists the car to the top and then releases it, the car stops with the aid of magnetic fin brakes. The trip to the top would be nerve wreaking to most, to me it was just a nice view. It takes about 1 minute and change to reach the top, very slow. Once at the top the car immediately disengages and you fall, reaching about 55 mph or so before slamming into the brakes. This ride is also accompanied with sound effects of thunder as you rise and fall. Before dropping, some fog machines blow out fog and shroud the loading platform from riders. Also there is an overhang above the car that prohibits the rider from seeing if their about to drop. Again, this ride would leave the nerves of any casual rider completely shot. Unfortunately due to the low capacity and high ridership, this has a long line during the night when the crowds are present. All in all, AtmosFEAR was a fun ride because of the anticipation of the drop, the height and the stomach dropping sensation. This was a great addition to a pier park like Moreys Piers.